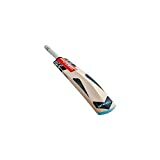 You are a quality bats person who likes to drive the ball down to the covers hey, well review the GM Octane F2 606 Cricket bat as an option for you to buy next. The flat face of the blade and the low sweetspot make the setup of the Gunn & More Octane 606 cricket bat a great choice for those blessed with the ability to stroke the ball away straight and with power from the bottom of the bat. We review the 606 model of the Octane bat here, this model has a Grade 3 English Willow construction, which means you might see a few blemishes in the wood grain but the quality of Gunn & Moore bats shines through and this profile suits its application perfectly. English Willow grades obviously reflect quality, the Grade 3 used for the Octane 606 Gunn & Moore bat though is really pretty great for the price. 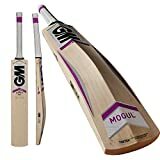 I’ve seen these cricket bats well under £100 and considering the quality of the wood and craftsmanship behind all GM bats, this is a great buy. Who should hit with this Octane 606 cricket bat? Octane GM cricket bats that we review have a very low swell on the back and are a nice heavy weight. Because of the position of the spine they are very much balanced towards the bottom of the bat and suit the drive shot. You can really connect through the ball at the bottom of the bat, obviously this makes it slightly more challenging when you need to catch a ball at the top and our review suggests you really need to be able to swing precisely with the Octane 606 GM bat. With all Gunn & Moore cricket bats you get some top quality features and ‘technology’ as all the brands call it. The Octane 606 includes lots of features to make it last well for you. Gunn & Moore include ToeTek (a shield for the toe to stop it going manky) and Dri-Guard (a special waxing to stop the water eating it up) in the Octane F2 DXM 606, both these features will see the life of your bat extended, even if you don’t look after it! These additions are little things, however buying a cricket bat every season isn’t affordable for many of us so they all help add to the sale of the Gunn & Moore Octane 606 cricket bat. Octane cricket bats have a very specific target batsman or batswomen, they are designed for the player that drives the ball more than anything else. The low sweet spot and all the weight at the bottom with the swell of the spine is designed to help this. The 606 model of the Octane is a fantastically well prices entry point to this type of bat and it’s not like the Grade 3 english willow is cheap, it’s still good quality stuff. Don’t buy this cricket bat if you play out of the middle or like me you are too weak and lazy to swing fast enough through the drive. If you are a young, strong, progressive driving batsman, the Gunn & Moore Octane F2 DXM Cricket bat is a great bat for you to buy.